Physical activity plays a big role in physical development and health, but did you know there are many other benefits of physical activity on emotional, social, and cognitive levels too? Whether as a parent, guardian, or grandparent, or as a childcare provider, ECE/RECE, kindergarten teacher, recreation leader or other professional working with children, you can make a huge difference for the children in your life. Give them an early start in active play, and you set them on the path to a happy childhood, and a lifetime of healthy living! 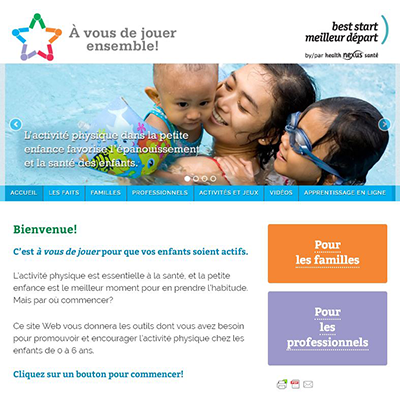 This bilingual website will give you the information and tools you need to be able to promote and encourage physical activity for children 0-6.